Epidote vein, La Motte (Gr. Is.). Arthur Mourant, F.R.S. published several reports on the minerals of Jersey in various publications of the Annual Bulletin of La Société Jersiaise from 1934 onwards (Mourant & Warren, 1934, pp. 73 - 88), and in 1961 he published his first Minerals of Jersey (Mourant, 1961, pp. 69 - 90). In each, he cites the work of other authors, starting with the pioneers, Fathers Teilhard de Chardin and Pelletier and the Geology Section Reports in the Bulletins by A. J. Robinson. In the reference work used here (Mourant, 1978, pp. 4 - 22) he gives the chemical formulae, the host rocks and the localities (with a map) of each mineral, in alphabetical order. A summary of Dr. Mourant's findings, and those of the present author are presented below. Discussions with members of the Geology Section of La Société Jersiaise and the instruction and guidance from Dr. A. E. Hill, a colleague and present Chairman of the Section, are gratefully acknowledged. 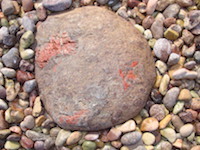 Other references used are to be found in the descriptions of the relevant rock types of Jersey. 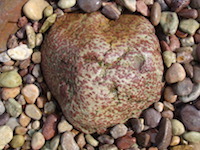 Jersey has a great variety of minerals but to some authors the specimens are not as interesting as their host rocks. There are several small, but perfectly formed ore minerals, such as haematite, complete with their gangue mineral(s) and some larger ones such as sphalerite. Their colour, lustre, symmetry and form are generally typical of the mineral and several varieties may exist such as different forms of silica. They occur in several different ways, for example, in rock outcrop as part of the rock's mineral suite, in veins, dykes, faults and joints where they have crystallised along the plane, and in cavities such as vugs and druses, where again they have the typical form of crystals which have grown from the walls into the cavity. Pegmatites also exist with striking crystals of white quartz and pink orthoclase feldspar c. 10cm long. Here, it is intended to summarise occurrences of the main minerals in the felsic and mafic groups and some of the minor occurrences in the accessory and secondary groups; the various relationships are described in the textures section. Quartz crystals occur principally in the granites and vary from clear to milky types. 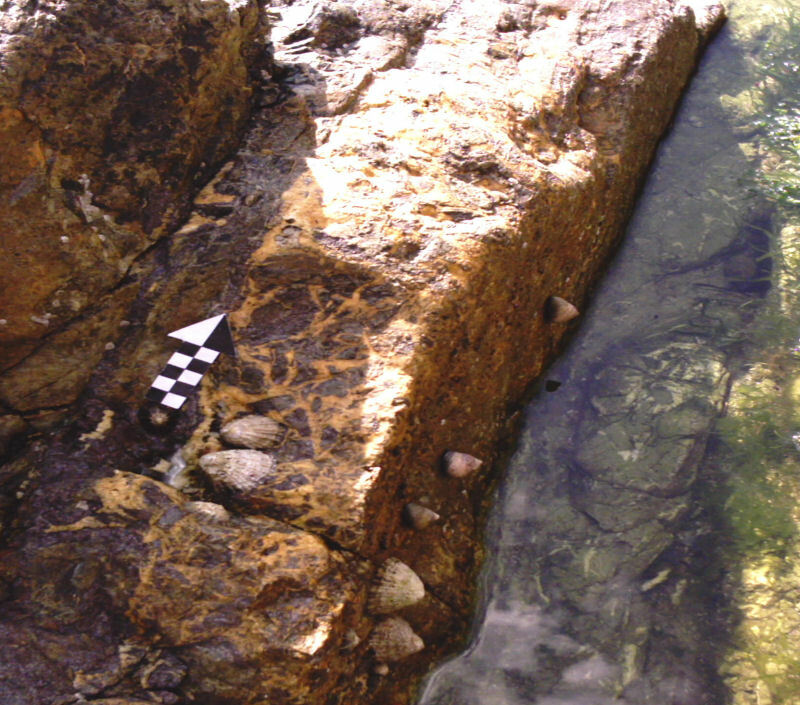 The largest euhedral and subhedral varieties have formed in pegmatite outcrops at La Rocque and various crystal forms can be found. 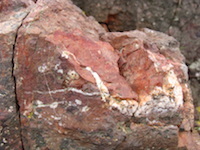 Orthoclase feldspar crystals occur in the same situation as large, anhedral, pink to red aggregates, often showing the re-entrant forms (negative outlines) of adjacent quartz crystals, while fine euhedral zoned crystals can be seen in the coarse outer granite at Grosnez and Sorel Point. Other euhedral crystals can be found in some of the acid porphyries. Plagioclase feldspars occur in the granodiorites, diorites and gabbros and the andesites. Obvious examples of the different types, such as albite, andesine and labradorite, are not readily identifiable in hand specimen but are known from microscope studies. 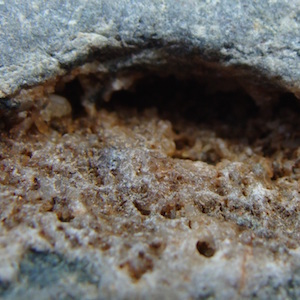 Muscovite mica is not abundant but occurs in pegmatites at Le Pulec and Le Côtil Point. 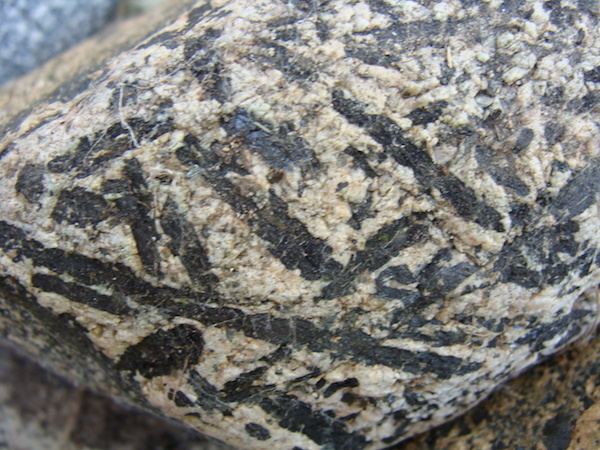 The mafic minerals such as Biotite are best seen in the mica lamprophyres, for example at Le Petit Portelet, Gorey; elsewhere it occurs as small black to brown flakes in the various granites. Hornblende, the principal amphibole, occurs as small black crystals in some granites but the best examples are long slender needles and the bigger columnar varieties in the appinites and diorites from Le Nez to Le Hocq (photo at start). Perfect cross-sections can be found which are hexagonal and have c.120° angles between the two cleavages. Actinolite, a green fibrous mineral, and also a member of the amphiboles, which can sometimes be confused with epidote, occurs as radiating masses with the hornblendes in the diorites and gabbros but also in diorite dykes and various andesites. Epidote occurs in patches and veins in the diorites at the eastern end of La Motte (Green Island). 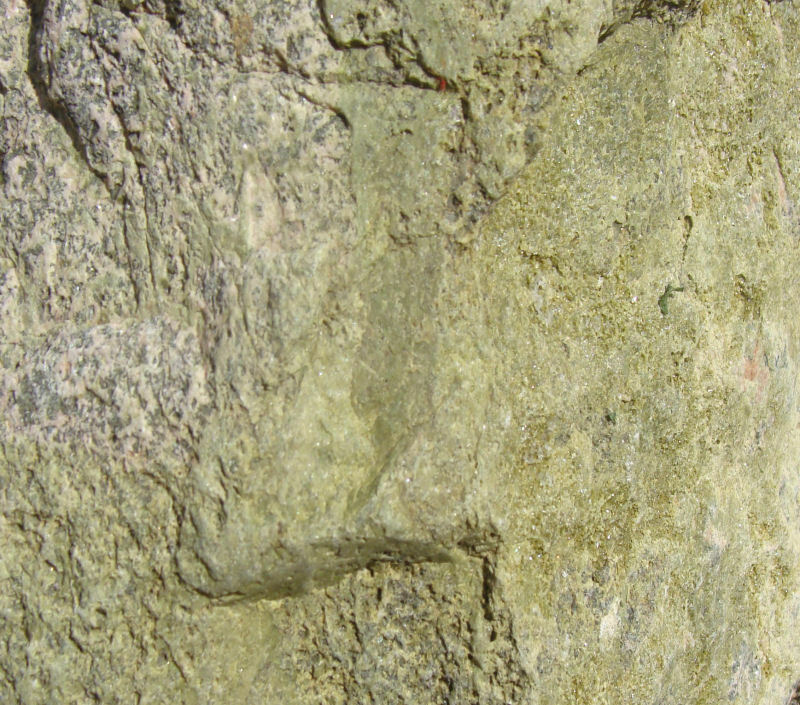 Epidote occurrences in diorite, La Motte (Green Is.). Augite and olivine occur in the diorites and gabbros and are best seen between Le Nez Point and Le Hocq and in the gabbros of Sorel Point. Augite, the main pyroxene, is dark green-black and occurs as short, prismatic crystals and exhibits octagonal cross-sections with 90° angles between the two cleavages. 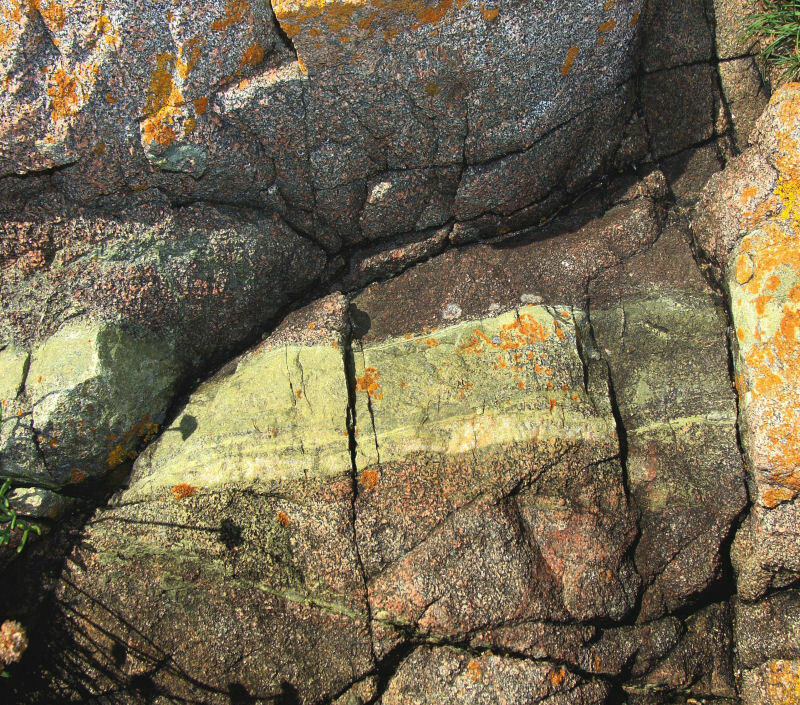 Olivine occurs in the gabbros of Sorel Point where it has been serpentinised as it has also been in the mica lamprophyre dyke on South Hill, St. Helier, which has serpentine pseudomorphs of olivine. 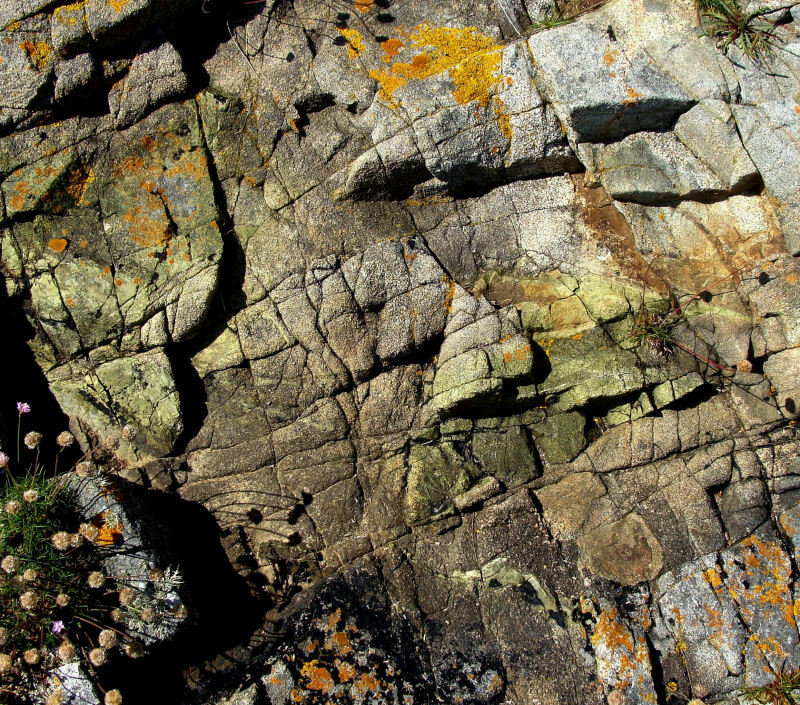 Other examples can be found in the gabbro at Ronez Point and in the gabbroic dyke at Wolf Caves. Accessory minerals such as apatite, zircon and sphene of various sizes can also be found in the granitic and dioritic rocks. Secondary minerals, alteration products, such as chlorite flakes and epidote fibres occur in association with the above mafic minerals which have been altered by hydrolysis or hydrothermal action and cause the green colour seen in the diorites and gabbros. Sericite, a white muscovite, produced by hydrolysis or hydrothermal action has altered some of the feldspars. Sphalerite (zinc blende) vein in ankerite, Le Pulec. Metallic crystals of minerals such as haematite, magnetite, sphalerite, pyrite, chalcopyrite and minor arsenopyrite also occur in small amounts. 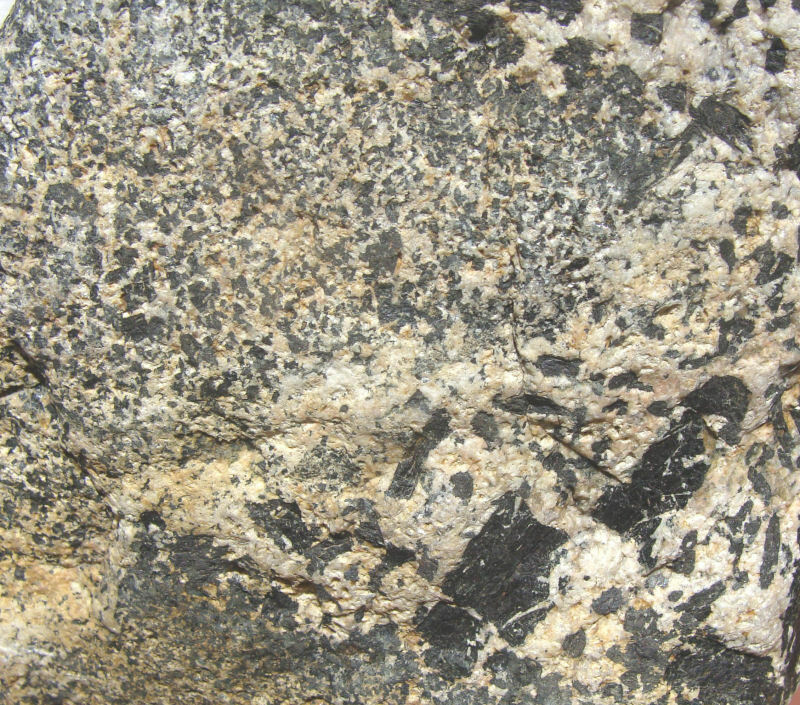 Sphalerite (zinc blende) occurs in a wider, 20-50cm, vein near the shale-granite junction at Le Pulec with ankerite (see photos above) as the gangue mineral and with some galena, which also occurs in previously mined nearby veins, with minor arsenopyrite. More detailed information on this mineralisation is given by Ixer (1980) and Ixer & Stanley (1980). Haematite and quartz in rhyolite, La Crête. Pyrite in quartz, Le Pulec. 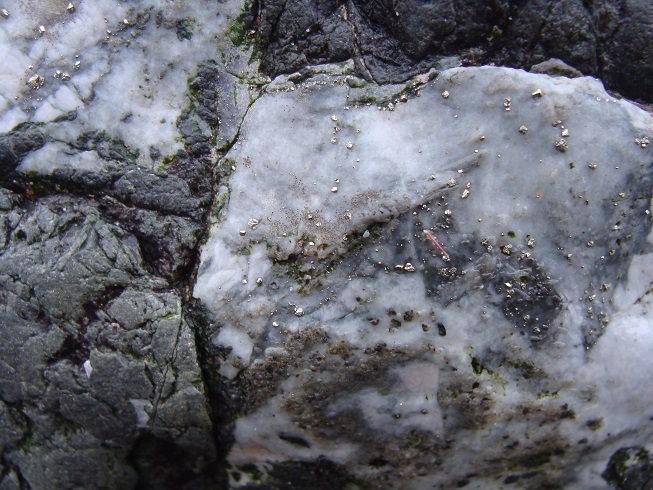 For example, haematite crystals (above) occur in narrow, 5-10 mm, quartz veins in the flow banded rhyolites around La Crête Point while magnetite occurs as large crystals in the granite platform, north of La Corbière Point. Pyrite and chalcopyrite occur as scattered crystals in the shales at Le Pulec and in the granite at L'Étacq. Pebbles and small boulders of chalcopyrite have been found near Seymour Tower, with the weathered copper giving them an obvious green colour. 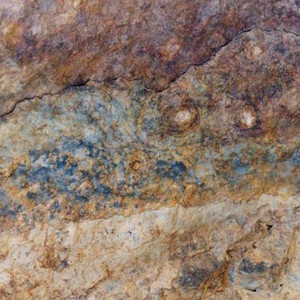 Elsewhere, haematite is evident as medium-dark red films and veins, and limonite, the hydrated variety of iron oxide, produces the yellow colours on the various weathered surfaces of the rocks. Metamorphic minerals are not easily recognisable in hand specimen but occur where the shales have been altered to cordierite-biotite hornfels at L'Étacq in the northwest, while elsewhere, chlorite, prehnite and pumpellyite can be found in the igneous complex of the southeast. Other minerals only seem to occur as small specimens and those that may be of interest for their colour or crystal form are as follows; the brown garnets at Le Côtil Point and in the granite geodes of L'Étacq and Le Hocq; chalcedony, a pale grey, amorphous type with concentric patterns is found along joint planes in the Northwest Igneous Complex at Sorel and Ronez and is also found in veins with barytes. Possible andradite garnets, Le Côtil Point, St. John. patterns on face of vein. 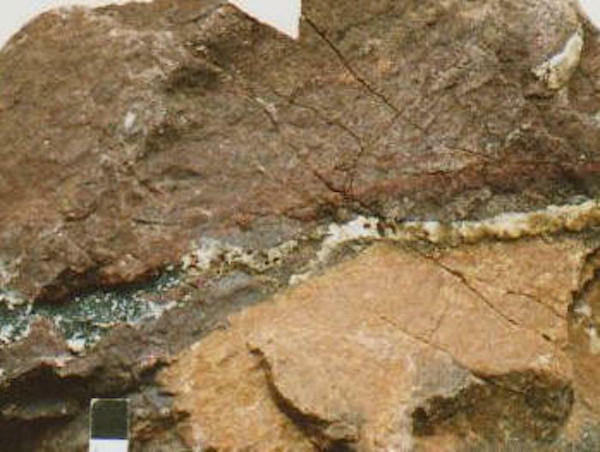 Jasper, the red variety, however occurs in the rhyolites north of Anne Port around La Crête Point and in the andesite at La Colombiere Point; green atacamite and malachite, hydrous copper chloride and carbonate respectively, occur as an alteration product of chalcopyrite in the rhyolites of Bouley Bay and at Le Côtil Point. Mourant, A. E. & Warren, J. P. 1934. Minerals and Mining in the Channel Islands. Rep. Trans. Soc. Guernesiaise. Vol 12 (for 1933), pp. 73 - 88. Mourant, A. E. 1961. The minerals of Jersey. Ann. Bull. Soc. Jersiaise. Vol. 18. pp. 69 - 90. Mourant, A. E. 1978. The Minerals of Jersey. Société Jersiaise. Ixer, R. A. 1980. The ore minerals of Jersey Ann. Bull. Soc. Jersiaise. Vol. 22. pp. 443 - 451. Ixer, R. A. & Stanley, C. J. 1980. 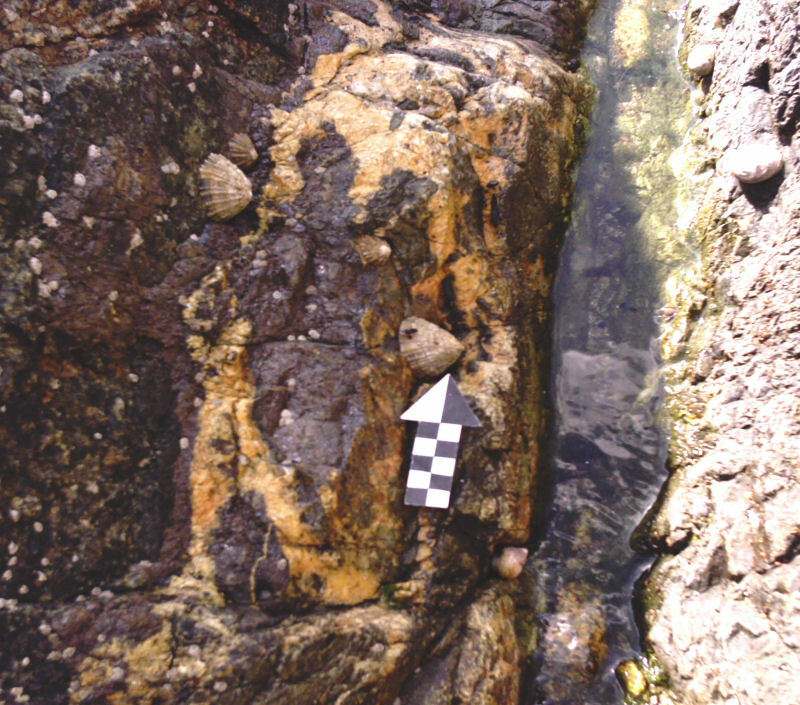 Mineralisation at Le Pulec, Jersey, Channel Islands. Mineral. Mag. Vol. 43. pp. 1025 - 1029.